Here’s a solution to the common problem of putting a nice plant in a pot, forgetting to water it and then it dying. Plant the flowered stem of an Agave instead. Agaves die when they flower, so you can just discard the prickly bit and keep the stem. I don't really know how long the stems will last but as they can be used as fence posts it will probably be a while. It doesn’t need watering and is a real statement piece. 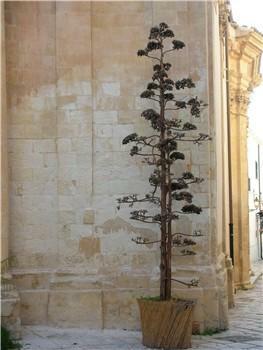 Seen here in Scicli, a baroque town in southern Sicily.